It gives me great pleasure to announce that Attack on Pearl Harbor is now on sale in some parts of the world (although players in the US may have to wait another month). 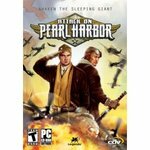 This arcade-style aerial combat game for PC allows players to choose between a US campaign and a Japanese campaign, and combines simple and easy to learn gameplay with frantic dogfights and epic fleet battles. This isn't an airplane simulation - it's just good old fashioned fun. This game was developed by our favourite Slovakian client, 3D People, and designed by my International Hobo team. The design actually draws upon an earlier title, Air Conflicts, which sadly sank without a trace. Fortunately, the design work was not in vain as we got to use it on this game - and some other forthcoming games I can't yet mention. Attack on Pearl Harbor is very enjoyable game that is not only fun and fast paced, but best of all it's one of those games you can pick up and play for 5-10 minutes or one you can play for hours going through all the various campaigns and mission types. You can get the demo from here and elsewhere. There are several things about the design of Air Conflicts and its brethren that I'm particularly happy with, chief of which is the fail-continue structure. This isn't a game that makes you plug at the same mission over and over again to progress - if you crash your plane, the war moves on. There are no second chances. This structure means that fiero-seeking players have an even more demanding challenge (they must complete each mission perfectly first time) while more casual players don't have to worry about getting stuck, as they will continue to progress even when they fail - as long as they don't run out of planes! I'm also pleased with our handling of the Japanese campaign in this one - I don't know if anyone has made a tragic campaign mode for an air combat game before, so it might even be a first. The game is dedicated to the real service men and women on all sides who fought bravely in the service of their countries. Please, please, please, could you make a OSX port? I really want to try out your games but I'm still on the PPC architecture (probably upgrade when Leopard is released). Suyi: Alas, the decision is not up to me! But 3D People did eventually do a Mac version of Heretic Kingdoms, so it's not out of the question. I remember you talking about the structure of the campaigns for this game, and I think it's a good call. A flight sim game can be as realistic as it wants, but there's something so strangely Purgatory-like about being forced to play a single mission over and over until you complete it... I think you'll have judged your player base rather wisely.